My head canon, particularly in 4th edition, is that both the agrarian homebodies and the lithe adventurers exist, with the former as the majority of the halflings -- and the lithe adventurer the result of a hormone change in a given halfling. It eventually subsides, after about twenty years, though not all wandering halflings last that long. I do like the mental image of a 50+ year old Lidda hopping up and down trying to squeeze back into a pair of leather pants while her embarrassed teenage daughters look on. I won't link it because it's very, very, very NSFW, but if you've got a thing for halflings, do a google search for the erotica webcomic Alfie. Shortstack stuff is pretty excellent, and Alfie is AMAZING, but holy crap is that hard to draw without making it look like you're going for an entirely different, and very illegal, thing. It's a very precise talent. That's pretty much the general assumption in 5e. 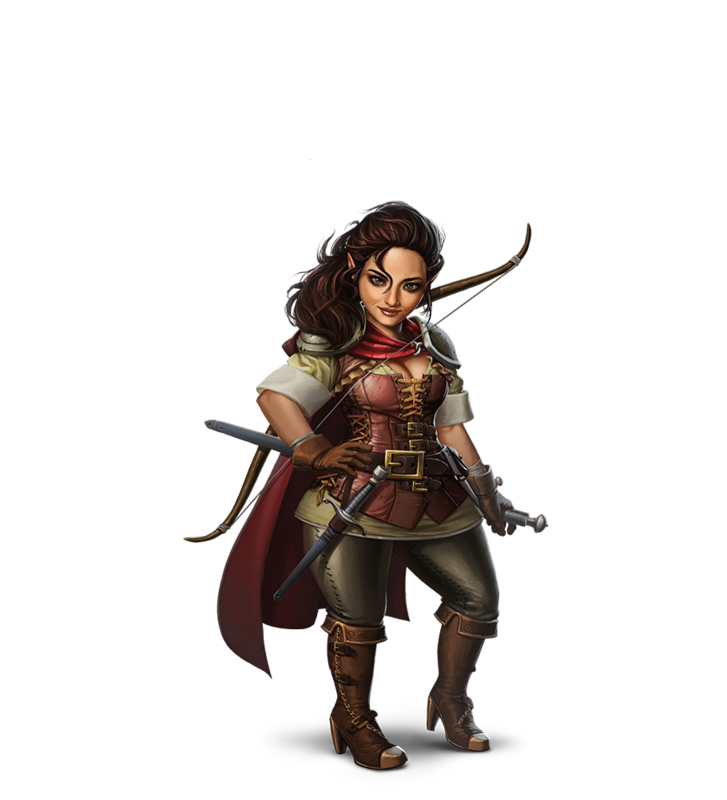 The writer also tried to reconcile the pre-3e and post-3e versions of the Halflings stating that Stout Halflings are generally settled and tend to be very hobbit-like, while Lightfoots are nomadic. Skin Tones: Usually mottled greys and browns. -Skum are foul-smelling fish-men created millennia ago as a slave race for the Aboleths. They have long tails with webbed ends, and are strong swimmers. They lack much charisma or gathering skills, and are usually found in the employ of smarter creatures- this makes them uncommonly encountered in the undersea world, as they form no kingdoms. Jab's Notes: A pretty dumb-looking race in 3e, they barely have a bio at all- just a physical description and a mention of the Aboleths. -Skum are very similar to Troglodytes, but are more aquatic. Dennis L McKiernan's Mithgar books (which were originally envisioned as a sequel to LOTR) had the Warrows, which started off nimble adventurers when younger, but grew to be stout homebodies once they grew older. One of my personal favorite settings and my own take on dwarves halfings and elves is defiend by it. Yep, one of the first fantasy series I ever read. Disabled (Construct)- Golems do not speak. Responsibility (Amulet Holder)- Shield Guardians will obey the wielder of a bronze amulet, linked to them from creation. 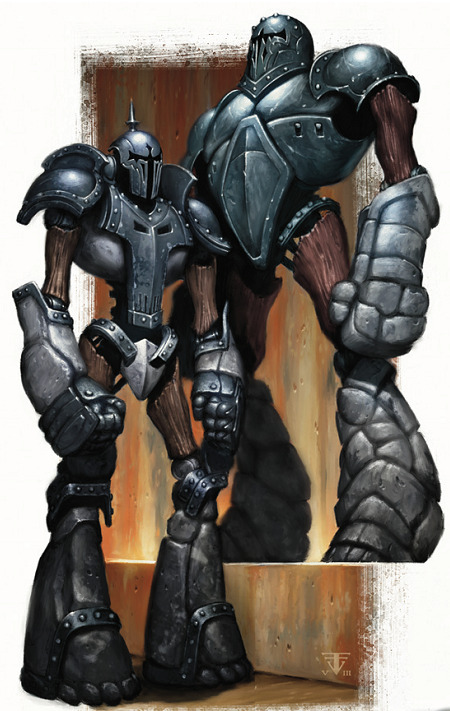 -Shield Guardians are a specific kind of golem created by Spellcasters to act as guardians, protecting their more fragile masters with their bodies. Unintelligent, they will simply lash out at anything they're told to. Difficult to create, they obey the orders of their master, or the wielder of a bronze amulet (cast at the same time as the Golem's creation)- they will cease to function without the Amulet. -The Slaad are toad-like otherworldly beings from the Plane of Chaos. They enjoy disrupting society and civilizations, often via enabling a criminal or rebellious element. As of yet, their intrusions into Castellia have been small, as they are unwilling (or unable) to engage in a full-scale war with any forces they've uncovered. Slaad are typically solitary with groups of minions. Their most notable ability is to summon another Slaad of the same type. They usually only use these powers when there is no choice (such as when their death is certain otherwise)- they distrust other Slaadi, and don't want to owe a favor to another. Jab's Notes: These "Toad-People" remind me way too much of Marvel's Mojo- a villain I've always disliked. I've read hardly a thing on them, however, but I find the notion of Toad-People hard to take seriously as a threat. Not sure about their whole "Plane of Chaos" origin (I don't really use Planes of Order or Chaos as a recurring element), but I didn't want them to be a native species to Castellia- I have enough of those! Responsibility (Solitary)- Slaadi dislike each other greatly. -Red Slaad are the weakest and the stupidest of their race, being largely-solitary, aggressive predators. They are uncoordinated in group assaults, and typically only band together under the power of another. Their chief unique ability involves the creation of other Slaadi- they can implant eggs into other creatures, which will eventually tear them apart and produce either a Blue Slaad or, if the victim is magically-gifted, a Green Slaad. Granted, I usually ignore 75% of the beasties in any given edition’s core Monster Manual and almost never buy any of the other monster supplements. Natural and giant animals, Goblins, Orcs, Other Humans, Giants, Dragons, Trolls, Vampires, Skeletons, Zombies... What more do you really need? I tend to go by "Monsters Are Rad" as a mentality and amp up all the weird animals (hell, I'm combining the Monster Manual WITH Pokemon! ), but I wouldn't use many as even remotely common entities. I remember Murkglow repeatedly stating that I was using too many sentient races, and I keep creating more of them here, but for the most part, the others are rare, unimportant, or seen in only certain areas. And like I've said before, I would probably just drop Elves, Dwarves & Orcs entirely if left to my own devices, and come up with other stuff. I think once I'm done building stuff, I'll actually point out populations or what "REALLY counts".